Alright, everybody, time for the first review of Vic Mignogna Month! And, according to Wikipedia, this is one of his most well known roles in anime. Apparently, it’s up there with Full Metal Alchemist and Ouran High School Host Club. Well, we’ll just have to see about that. D.N.Angel is a Fantasy/Romance anime based on the manga by Yukiru Sugisaki and published by Kadokawa Shoten. Tokyopop did holds the rights, but since they closed their doors, as of this review, the series has not been relicensed. The 26 episode anime comes from Dentsu/Xebec, originally running in 2003. ADV Films used to holds licensing rights, but current rights belong to Discotek. 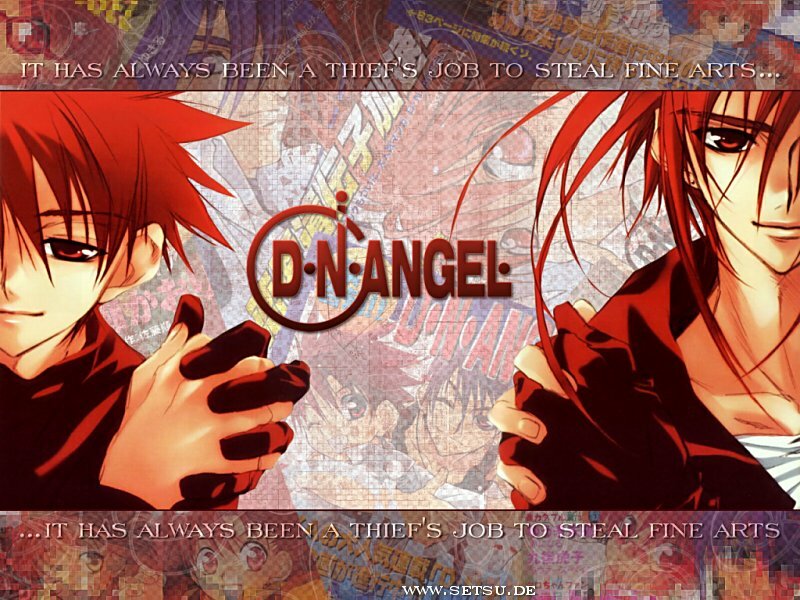 D.N.Angel’s plot is a little hard to follow, because for most of the series you’re following Daisuke and Dark stealing art works plus some comedic filler episodes involving the Harada twins or Wiz (he’s called With in the dub, but I don’t care. He’s Wiz to me). Each episode has it’s own story to tell, and you don’t really see a set plot until later on in the series. This isn’t a bad thing, because it does help establish the characters more before the big climax of the series. However, it leaves the viewer wondering when the ACTUAL plot is going to happen. Then something DOES happen and you feel like this would be a good end to the series. Even credits role with more of the characters at the end.... However, D.N.Angel decides to pull a ‘psych’ moment and show you “nope not done yet”. And, also, there is suddenly foul language (small amount, but compared to having none so far, it stands out). So.... The two problems I have with this series is lack of strict plot, and that it doesn’t know when to stop. The characters aren’t really full of depth or development in the series at all. Whatever development the characters have, it all gets thrown in during the last episodes. The one thing that really seems to grow throughout the series is Daisuke and Riku’s relationship. Makes sense..... But what about Dark’s past? Or Satoshi’s growing friendship with Daisuke? Hell, when did Risa and Satoshi suddenly have a thing for each other? Sorry, none of that is explained much. Even the relationship of Daisuke and Riku doesn’t start happening till later in the series. It seems like a lot of the characters just seem to get the short end of the stick. Alright, pertaining to the English Dub, all I’m going to say is this....... My ears are bleeding now...... Seriously, I have never heard so much pitchy voice acting in any anime; not to mention a few bad dubbing matches. A lot of the choices for major characters had a very hard time playing young teens, when you really hope for a little maturity in their voices. Prime examples, Kevin Corn (Full Metal Panic: Fumoffu) as Daisuke and Luci Christian (Princess Tutu) as Risa. Then there’s the “I’m the most mature and serious character, but my voice doesn’t make you take me seriously”; such as the case of Greg Ayres’s (Nabari no Ou) Satoshi, who does make it work for him later on. Here’s the thing in all of this, D.N.Angel is more along the lines of after-school-special, so, in some circles, this kind of acting can be explained. And, eventually, the actors make due and it turns into a decent performance on all parts. Still doesn’t give it the best excuse in the world, but that’s all I got (so the dub was bad but that’s…. okay?). Some other known voice actors for D.N.Angel include: Illich Guardiola (Le Chevalier D’eon) as Krad (if I hear him yell “Dark” one more time, I am going to destroy the TV), Hilary Haag (Chrono Crusade) as Riku Harada, John Swasey (Soul Eater) as Daiki Niwa (and the only character I really enjoyed), Monica Rial (Gunslinger Girl) as Towa, and Jessica Boone (Azumanga Daioh) as Mio Hio. Now, since this month is all about good old Vic, it’s time to see where his performance stands in the anime. According to sources, his role as Dark Mousy is among one of his most well know voice acting roles (Along side Ed Elric and Tamaki), however, it’s not quite one of his best. He’s certainly is the best voice actor in the series and fits the role really well from start to finish. It’s just one of those things, like Johnny Young Bosch with Ichigo from Bleach, I just hear Ed Elric in my ear the entire time. Don’t get me wrong, he’s not terrible, he could probably have done better though. If I have to grade his performance, I would give it a solid B because of the confidence and guile that was put into this role. In some circles, I believe D.N.Angel was just a prequel into what would soon become Vic’s real breakout role from Full Metal Alchemist. At the end of it all, D.N.Angel isn’t exactly the most well planned anime. From the animation to the voice acting, a lot of better choices could have been made to make the series even better! But it did give viewers the chance to look at the soon-to-be highly demanded voice actor, Vic Mignogna; and the budding romance between Daisuke and Riku was a fun one to watch. But, other than that, it’s an after-school-special and not very much of a stand out anime and can be completely forgettable. If you’re into cute romances and handsome thieves, then check it out. Be warned though, constant bleeding of the ears may occur. Ah yes, I remember when I saw this quite a few years back. I liked it, but it was definitely before I started focusing on storyline. Anywho, a decent anime to watch if you're interested in a starter series. On Bonus Bitcoin Faucet you can recieve free bitcoins. Up to 5,000 satoshis every 15 minutes. Ever considered automating your free satoshi collections with a BITCOIN FAUCET ROTATOR?